If a book garners lots of clicks, then it will rise in—or maintain—its ranking in Amazon. Pure logic. I’ve written my book. Finally. Its published. Phew. Now what? I’ve been studying browser categories and SEO (search engine optimization). My book was ‘missing in action’ when I searched on ‘mysteries’ and ‘women sleuths’. I was the classic invisible person. Really liked the character development as well as the writer’s descriptions of scenery, conflicted emotions, and untangling of old business. I tried a different approach. I searched on ‘Maine mysteries’. My book came up as #21 out of the listing of 1,200 hits. I searched on ‘professor mysteries’. It was #12 out of 1,200. Then I searched on retribution and it came up as #504 out of 1,200 hits. That’s pretty far into the search results but at least it’s there! Those results validate what I have read, in that fledgling authors fare better with very specific searches than with the larger, general searches—which, of course, is quite intuitive. I would love to hear how you manage your browser categories and your SEO. To do so, please enter your comments in the Leave a Reply box at the bottom of this page. Take me out of the realm of ‘sounds of silence’. Please! Wishing you and yours joy and peace. If a book garners lots of clicks, then it will rise in—or maintain—its ranking in Amazon. I’ve been studying browser categories and SEO (search engine optimization). 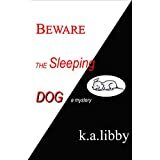 My book “Beware the Sleeping Dog” with my author name of k.a. libby was missing in action when I searched on ‘mysteries’ and ‘women sleuths’. I was the classic invisible person. However when I searched on ‘Maine mysteries’, my book came up as the 21st result out of the listing of 1,200 hits. And when I searched on ‘professor mysteries’, it was the 12th result out of 1,200. Then when I searched on retribution, it came up as #504 out of 1,200 hits. That’s pretty far into the search results but at least it’s there! Those results validate what I have read, in that fledgling authors fare better with very specific searches than with the larger, general searches—which of course is quite intuitive. I would love to hear how you manage your browser categories and your SEO. To do so, please enter your comments in the Leave a Reply box below. Thank you!